Coulomb partners with automakers and the DOE to bring EV charging to nine cities. 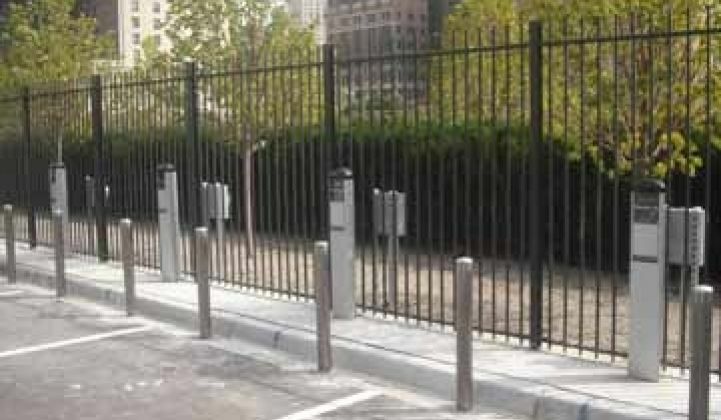 Coulomb Technologies announced today that it will spearhead a campaign to deliver nearly 5,000 free ChargePoint Networked Charging Stations to homes and public spaces across the U.S.
About half of the units will be installed in public places, primarily curbside, for electric vehicle owners who do not have garages, and another 2,000 charging stations will be offered to anyone who buys a Ford, GM or Smart USA electric vehicle. Installations will begin immediately, with 1,000 slated to be completed by December of this year. All of the units are expected to be in place by October 2011. In comparison, Coulomb installed approximately 700 units in 2009. "We want people to see charging stations and feel comfortable that they'll have somewhere to charge," said Richard Lowenthal, CEO of Coulomb Technologies. A major concern about the impending EV invasion is that people will not be able to find charging stations when they need them or won't have the correct permitting to be able to put a charging station in their home (not to mention the fact that many utilities are not ready for the equivalent load of an extra house being put onto the grid). Lowenthal said that this partnership between the three automakers, Coulomb, and the Department of Energy is geared to smooth many of those bumps in the road. The stations will be concentrated in nine cities in the U.S.: Austin, Texas; Detroit; Los Angeles; New York; Orlando, Fla.; Sacramento, Calif.; the San Jose/San Francisco Bay Area; Redmond, Wash.; and Washington, D.C.
California is often referred to as the testing ground for EV integration, but half of the cities in the program are not in the Golden State. Lowenthal said that Coulomb has been working extensively with utilities in each city to let them know that the company will be installing charging stations; utilities will be notified when and where as each station is brought online. Despite industry concerns, Lowenthal is confident that the utilities will be ready. "They're aware of these programs," he said. "They know we're about to do a bunch of deployment." On the other side of the coin, Coulomb is working with partner cities to streamline the permitting process for charging stations, especially for homeowners. The stations will charge at 220 volts and depending on battery size, could fully charge the cars from partner automakers in two to three hours, although Lowenthal noted that most cars will not need a full charge, so even a half-hour of charging time would be worth it. The $37 million project is funded in part by a $15 million grant funded by the American Recovery and Reinvestment Act. Besides facilitating a smooth introduction of EVs, the infrastructure won stimulus money because of the jobs it will create. Coulomb estimates that the new charging stations will create 62,000 person-hours of work in the first year alone. "This is the kind of job creation that can't be outsourced," said Lowenthal. The majority of the installations are expected to go into public streets, workplaces and the homes, although some retailers, like McDonalds, have already expressed interest in wooing the EV crowd. The large rollout will also let Coulomb test its software technologies and tweak them for a mass audience. Drivers can use their smart phones to find locations with open stations and can also get text alerts if their car needs to be charged, or if the power connection was cut off during charging. Charging station owners, or hosts, as Coulomb likes to call them, can set up a payment system to recoup the cost of electricity and maintenance (similar to a parking meter), while utilities can monitor the usage to help coordinate demand-side management. The data collected will be analyzed by Purdue University and Idaho National Labs. The results of this program will help Coulomb and its partners determine whether customers will want programs like reserved charging, which is not currently available. "This will foster adoption of and readiness for electric vehicles in the U.S.," said Lowenthal. "It's going to get more exciting as the year goes on."